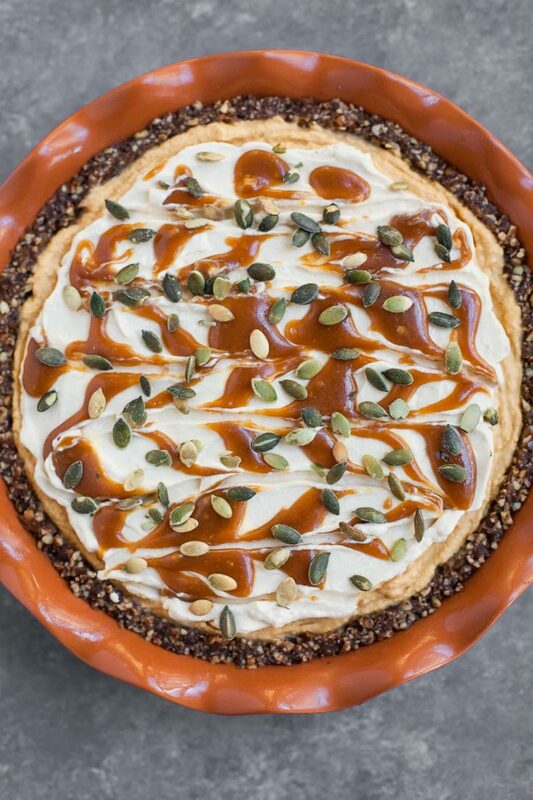 This pumpkin caramel cheesecake pie requires no cooking, and all the layers are made in the food processor with no need to wash it in between. It’s the perfect last-minute Thanksgiving dessert! This pie was originally published in fall of 2013. I’ve tweaked the recipe and updated the photos. This pie is so easy, and so good! If you already have your caramel sauce made (try salted caramel, salted maple caramel, or even store-bought), there is no cooking required–just a few rounds of food processing. And, in case you need another reason to make this, there’s pumpkin involved! There’s also caramel, whipped cream, and a delicious two-ingredient crust. The cheesecake layer is rich, but not overpowering–I think even people who don’t love cheesecake will probably love this. 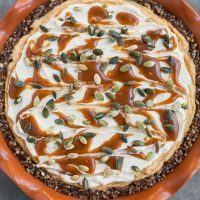 This pumpkin caramel cheesecake pie has several components, but they are all easy to whip up in the food processor. You don’t even really need to wash it in between layers. Also, it’s so much fun to press the crust into the pan, smooth all these amazing things on top, swirl in some caramel, and sprinkle on a few pepitas. 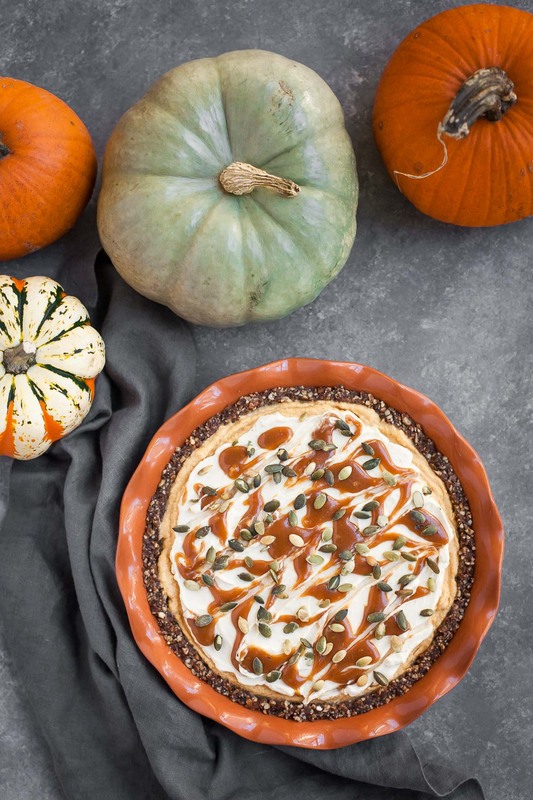 It’s almost as much fun to make this pie as it is to eat it! I made this for two hungry podcasters, and they both loved it. Even though Ben at first insisted he “didn’t want a piece right now”, he changed his tune as soon as he laid eyes on my slice. Basically, this pie is irresistible! I hope you give it a try for Thanksgiving, or anytime you need something sweet and easy but still festive. 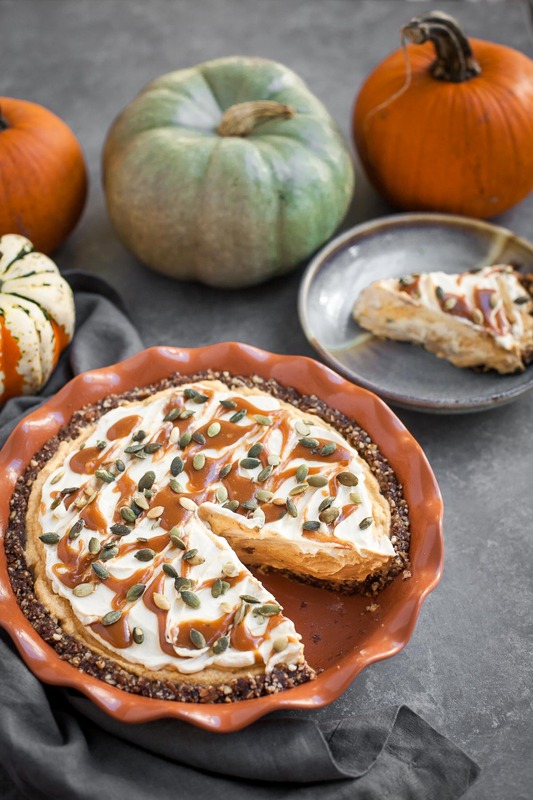 This pumpkin caramel cheesecake pie requires no cooking, and all the layers are made in the food processor with no need to wash it in between. It's the perfect last-minute Thanksgiving dessert! To make the crust, pulse the ingredients together in a food processor until finely chopped. Press the crust evenly into the bottom and partway up the sides of a lightly greased deep-dish pie pan or spring-form pan. To make the pumpkin cheesecake layer, combine all the ingredients in the food processor and process until smooth. Using a spatula, smooth the cheesecake layer over the crust. Stick the pie in the freezer to firm up a bit. To make the pumpkin caramel layer, add 1 cup of heavy cream to the food processor and process until it holds soft peaks. 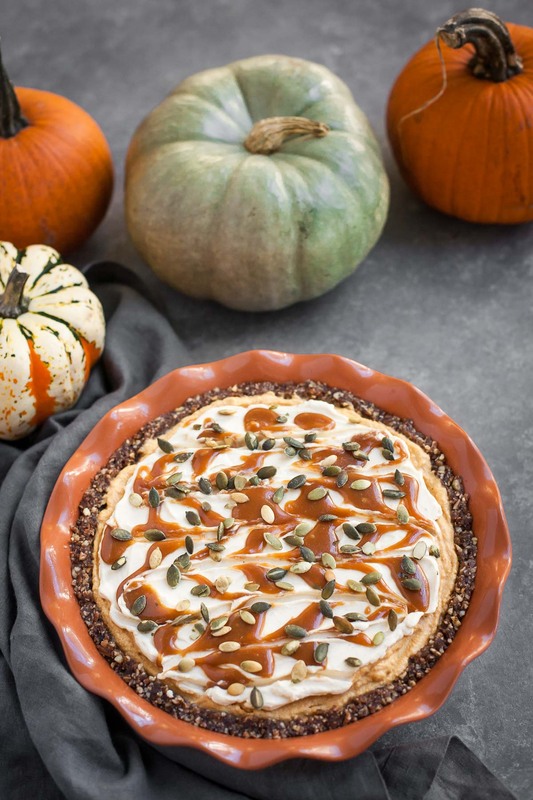 Add the caramel sauce and pumpkin and pulse until the mixture is combined and holds medium peaks, stopping to scrape down the sides of the bowl as needed. 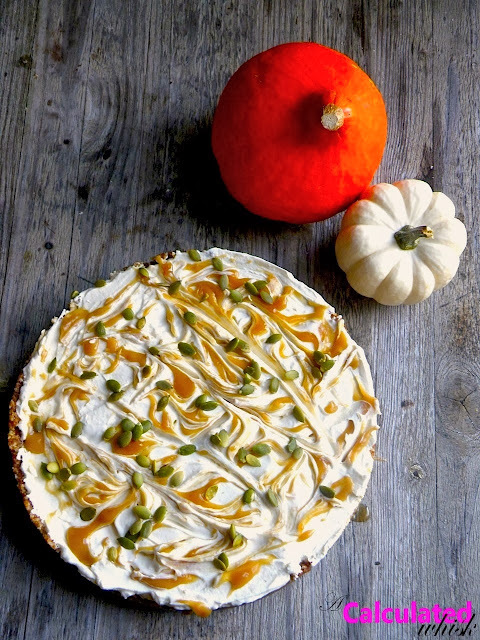 Spread the pumpkin caramel over the cheesecake layer and return the pie to the freezer. To make the topping, add 1 cup of heavy cream to the food processor and process until it holds soft peaks. Add the maple syrup and vanilla and pulse until the cream holds medium peaks. 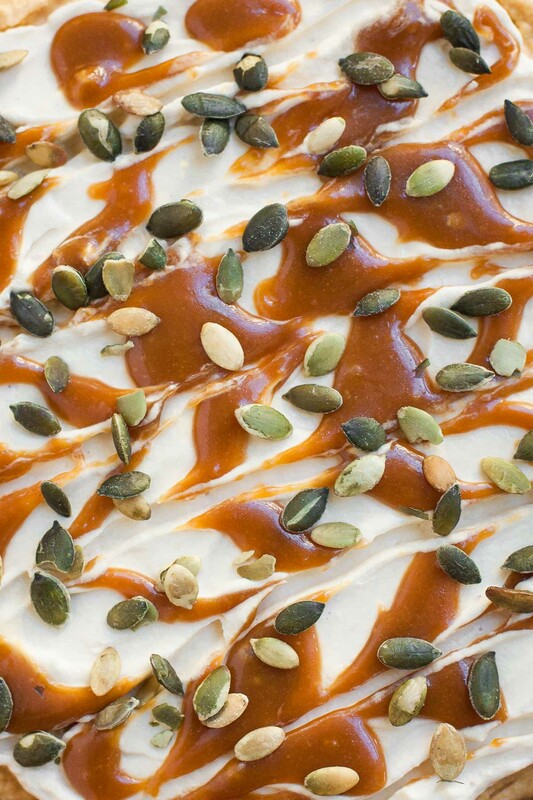 Spread the whipped cream over the pumpkin caramel layer. Drizzle the caramel sauce on top, then swirl with a knife or skewer to make a marbled pattern if desired. Sprinkle on the pepitas. Slice and serve cool. Store leftover pie in the refrigerator, where it will keep for several days. Just for fun, here’s one of the old photos! I was still using a point-and-shoot camera and remember being really proud of how these pie photos turned out. This pie looks fabulous! Can't wait to make. Thanks. Thanks, Judi! I hope you enjoy it. Love the recipe and the pictures are great. Makes me really hungry! Thank you! 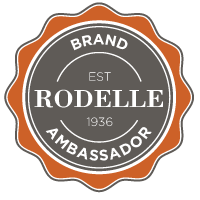 I just spent some time over at your blog, and decided I need to try your awesome pumpkin muffins! They look amazing. Pumpkin everything forever!!! It's gorgeous … & was so delicious, too!